Countless people find freedom from severe torments and sicknesses through the prayers of believers. People in the village could hear the sounds of a man’s screams as the rickshaw passed. It stopped near the building where the Christians met, and a desperate and haggard-looking family stepped out. They brought the screaming one with them and went in to the Sunday morning service. The pastor prayed. The believers prayed. They claimed Scripture and called upon the name of the Lord Jesus. 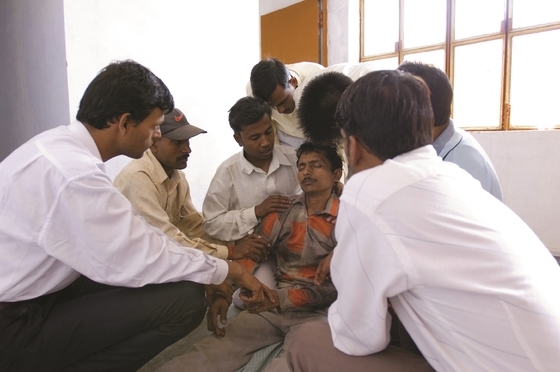 After Jagat witnessed God free his son from a torment he, a renowned witch doctor, had been unable to stop, he fell down at the loving feet of Jesus. His wife and children, along with their spouses, did likewise, and they all came up renewed. Jagat’s family started gathering every week with GFA-supported pastor Nirmalya, the same pastor who had prayed for Jagat’s son that Sunday. And so life continued for Jagat and his family. For generations, Jagat’s ancestors had lived on a plot of farmland, a tradition he and his four adult children continued. His children, along with their spouses, each had homes on the same property. They all worked alongside their father to grow and harvest their crops—mostly wheat and corn. The family even owned some oxen to help them plough their land, but despite all of their hard work, the family struggled. They had wheat and corn to eat and black tea to drink, but they had little else to fill their stomachs. The foods satisfied their hunger, but the family, especially the eight grandchildren, needed nutrition. 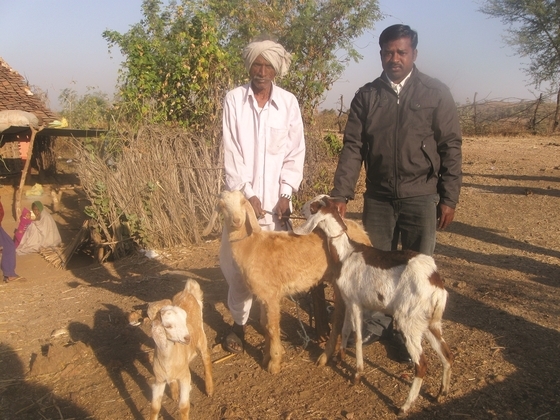 One December, Pastor Nirmalya invited Jagat to a special Christmas gift distribution where the loving father received a pair of mature goats, as well as a kid. That meant, from the very first day Jagat brought the goats home, he and his family received milk to drink—a quart every day. Jagat (pictured) received three goats through a Christmas gift distribution, and now his family has a steady source of nutrition. A splash of milk in their tea. A bit of buttermilk and ghee to cook with. Some curd to fill a child’s belly. The goats have made a difference. Jagat and his family can hardly contain their gratitude. To thank the Lord for His marvellous provision in their life, Jagat soon brought an offering to the church—a precious quart of milk to bless others in the congregation. All this has been made possible through the prayers and donations of GFA partners around the world.